...Off on a little side street. 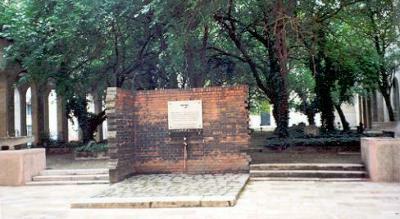 As you turn the corner into Herzl ter, a wonderful sight, bringing tears to your eyes. An open paved area in front with willow trees, and behind it a long line of arches. 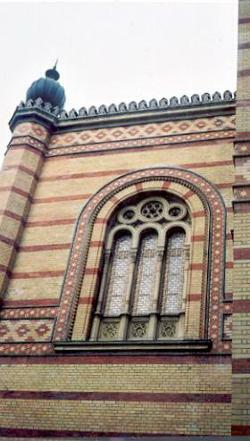 The totally restored synagogue is in stripes of fawn and brown brick, worked in intricate designs. 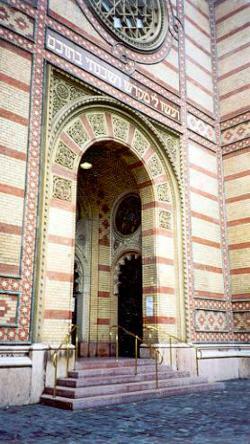 There are arched windows on the second floor, and the main entrance is on the right, beneath two tall hexagonal towers with star-shaped windows, and topped by large green and gold-leaf onion bulb turrets. The whole facade is very exotic and totally different to all the other buildings in the vicinity. Outside, energetic young members of the community arrange tours of the schul, and the adjacent museum. 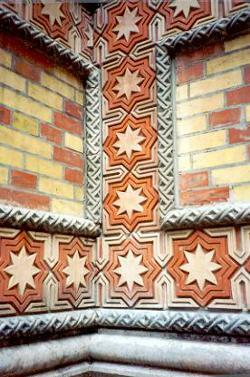 The building was planned by Ludwig Forster [1797-1863] in Moorish style. Construction began on 30th July 1854, supervised by the architect Ignac Wechselmann [1828-1903]. 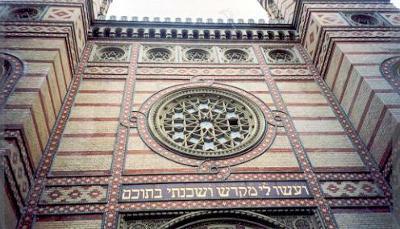 The synagogue was dedicated on 6th September 1859. Above the main gate is a scriptural text `...and thou shall make me a sanctuary where I can abode...’ Light comes to the interior mainly through the window just above the inscription. Inside the three aisles feature a mosaic floor. 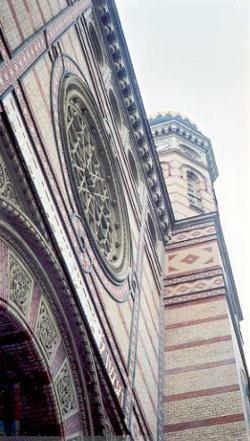 On both sides of the upper level are three large rose windows. At the first columns there are two pulpits with spiral stairs, the lower surrounded by adorned railings. The roof of the schul is very high, and totally covered in the richest decoration, with a beautiful dome at the front with blue and gold filigree design. 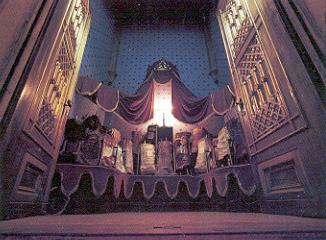 Beneath, a large and ornate Ark with many old and treasured Torahs. 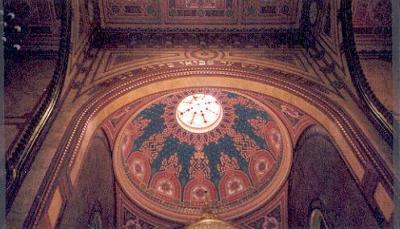 There are two levels of womens’ galleries, left and right, lit by circular and arched stain glass windows. The richness of the design and the breathtaking colours humble the visitor, sitting in awe in one of the dark wooden polished pews, head skyward, trying to appreciate every little thing. 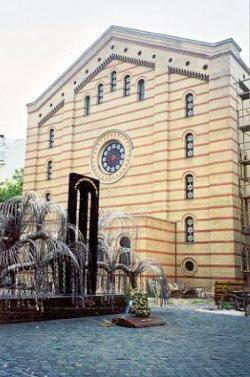 The synagogue can seat 1492 men and 1472 women. 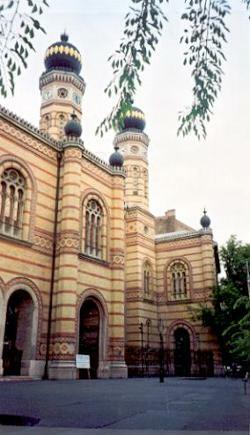 Much of the funds to restore the building, came from the Hungarian government, the rest being raised by the community and the Diaspora. Next door, in the left wing of the building where Theodor Herzl was born, there is a comprehensive and moving Judaica museum. The young guide who shows us around has just been told the terrible news that her grandfather has died, but bravely finishes her job. Behind the arches, to the left, is a forlorn garden cemetery containing the many Jewish dead found after Budapest’s liberation in January 1945. It isn’t open, and has become home to a number of cats and kittens. 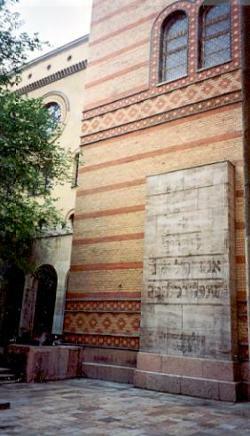 Beyond this, at the back of the synagogue, is an amazing memorial to the 600 000 Hungarian Holocaust victims. 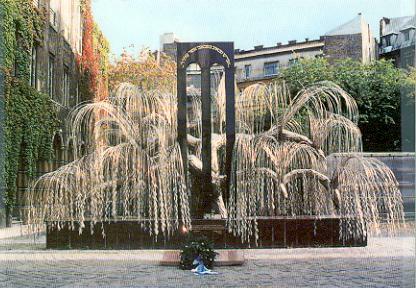 It’s in the shape of a willow tree, made from minute links of metal, each a tiny leaf. Also, tributes to Wallenberg, Anger, Lutz and the other Righteous Gentiles.